Flying Dog Woody Creek (4.8%): Summer finally hit Brooklyn this week. It's officially the season of flip-flops, ceiling fans, sidewalk tables and wheat beer. Although I will be in lovely Antwerp in almost two weeks tasting all those lovely brews I still couldn't resist to buy this six pack of Flying Dog's summer wheat beer expression on my way home today. 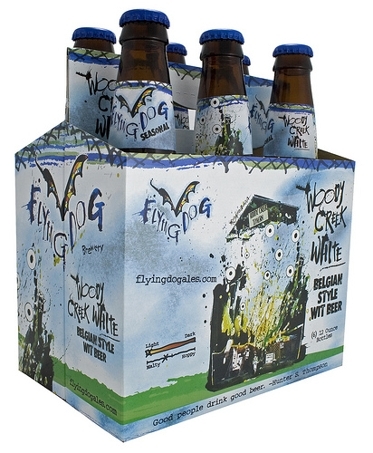 It just seemed the right thing to do... Woody Creek is a member of Flying Dog's seasonal line-up and brewed in traditional Belgian wheat beer style from malted and unmalted wheat and oat with addition of coriander and orange peel. Poured in a stem beer glass right out of the refrigerator... Look: Incredibly pale, haylike yellow color. Dusty and cloudy with tiny bubbles like a pear cider. White foamy head. Nose: Half a slice of lemon merengue pie and half a slice of and old fashioned banana cream pie in the same plate. Lemongrass and pineapple. Brisk, fresh, beachy and a little bit metallic. Palate: It has a fizzy and very thin mouthfeel, almost feels like watered down a little. I can taste the coriander here clearly. Grassy Belgian yeast, lemon zest and lime juice. Maybe also some bubblegum. Finish is short and slightly tingly with very faint white pepper notes. Overall: I kind of prefer my beer having a fuller body and with more texture I guess. Even if it is a summer wheat beer... It definitely tastes good, no doubt about that but I had a feeling of drinking a light beer all the time. Somehow it didn't fulfill my satisfaction... But to be honest I wouldn't reject an ice cold bottle at the beach while I am staring at the ocean. That would feel just right.